SIFNOS lies in the less touristed western half of the Cyclades between Serifos and Milos and is also located west of Delos and Paros and is about 130 km 80 nautical miles from Piraeus and 130 km south of Athens. It has an area of 74 sq. km and is 15 km long and 7.5 km wide. and a shoreline of 70 km, with a permanent population of approximatly 2000. The island is reached on the ferries which run on the Piraeus- Kythnos- Serifos- Sifnos- Milos- Kimolos line. There are also infrequent sailings to other islands in the Cyclades. 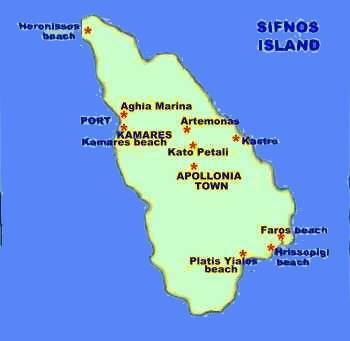 Sifnos was very wealthy in ancient times, thanks to its gold and silver mines. Proof of this, is the treasury which the Siphnians built at Delphi in the 6th century BC to house their offerings. However, it appears that something went wrong with the mines; either they were worked out or flooded by the sea and their production ceased. In ancient times, Siphnos's wealth was measured by the gold and silver it produced, in the last two centuries it can be measured by its cultural output.